So, I wanted to provide some accessible resources for using indirect assessments and talk a little about each one specifically and what I like and don’t like about them (sometimes it’s clinical opinion, sometimes it’s a research base). 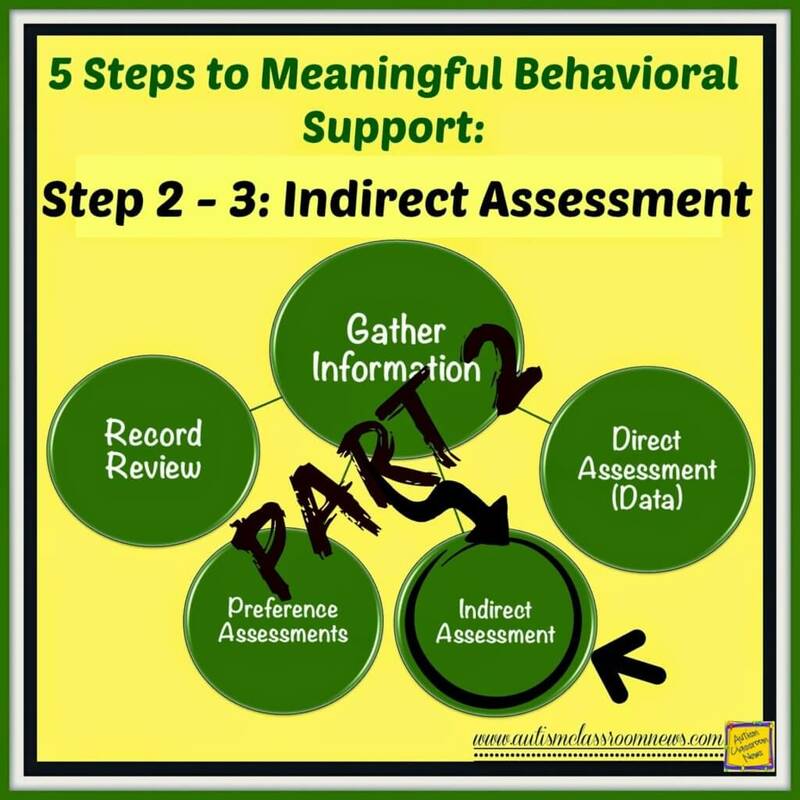 As I talked about in the last post, indirect assessment typically comes in two forms: interviews and checklists. Let’s start with interviews. The majority of interviews for FBAs originate from a model of the Functional Assessment Interview from the 2nd edition of Functional Assessment and Program Development for Problem Behavior, 3rd ed. by O’Neill et al. This link will take you to an Amazon Affiliate link for me, but be warned that the paperback copy of this book is $133 last I checked and a little more than half of that if you buy the Kindle version. However, if you are a BCBA or BCaBA or planning to become one, the new version of this book (that hadn’t been revised since the 80s) is great news. I just got a desk copy for my FBA class I teach and will know more about it when I’ve had more of a chance to review it. The O’Neill book has been a standard in the field for some time and may have been the first interview published. The interview they provide in the book is quite extensive (and long) and you will find many versions of it around the web (and noted below). The New Jersey Positive Behavioral Support in Schools has a wide variety of tools on their website. Function-Based Interview Tool for Parents (other language versions are available on the website here) has general questions for families to answer about their student. 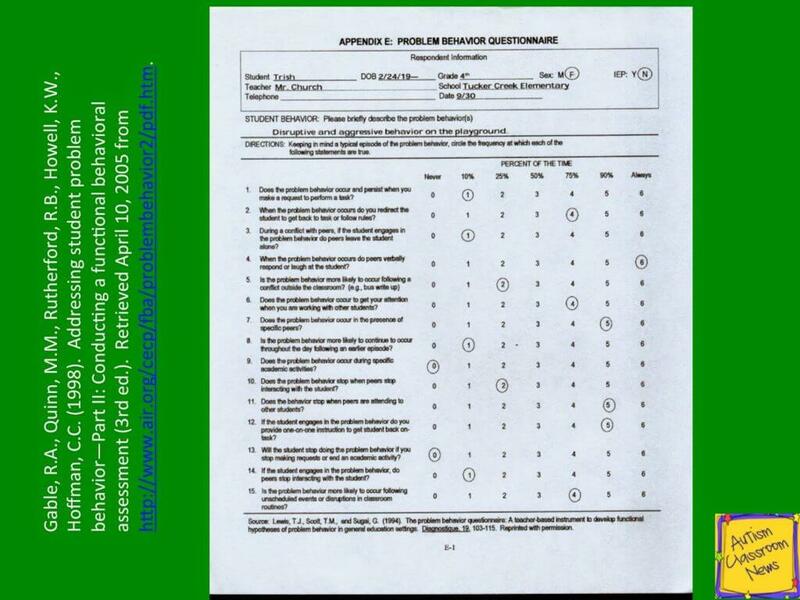 The Kansas Association for School Psychologists has a form of the Functional Assessment Interview – Young Child adapted from the original FAI from O’Neill et al. It has a communication function grid that is particularly helpful for assessing how young children communicate for different needs. The Kansas Institute for Positive Behavioral Support has another version based on the FAI that includes a mini-preference assessment as well as more open ended questions. The Center for Effective Collaboration and Practice has an FBA miniweb with a guide for functional assessments and behavioral support in schools. 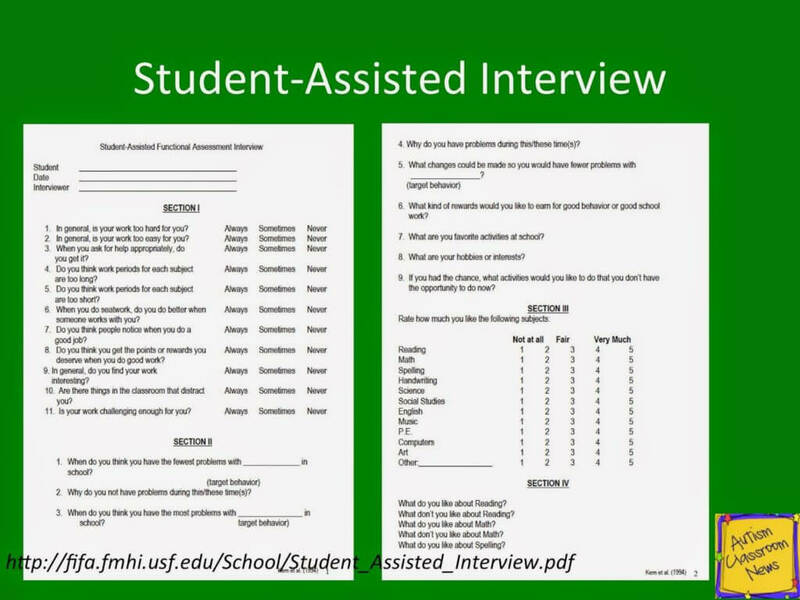 One of the tools they offer is a quick, 2-page interview (with an example of a completed version) called the Functional Assessment Interview Form, that is designed to be used to interview teachers or other staff and families as appropriate. I like this version for a quick form to use as an interview with straightforward questions. I do find it works better for students who are higher functioning or typically developing with challenging behaviors (higher functioning ASD, children with emotional behavioral disorders, language delays, learning disabilities) than children with ASD with intellectual disabilities. However, I’ve used it as a guide for both. 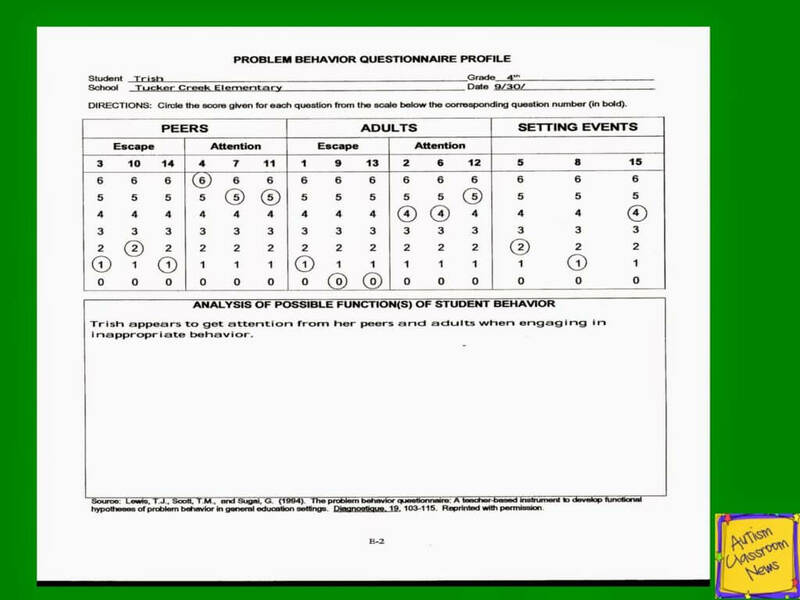 The Waisman Center has samples of interview questions that include the communication matrix and a preference assessment within it. It also has directions on how to use it. 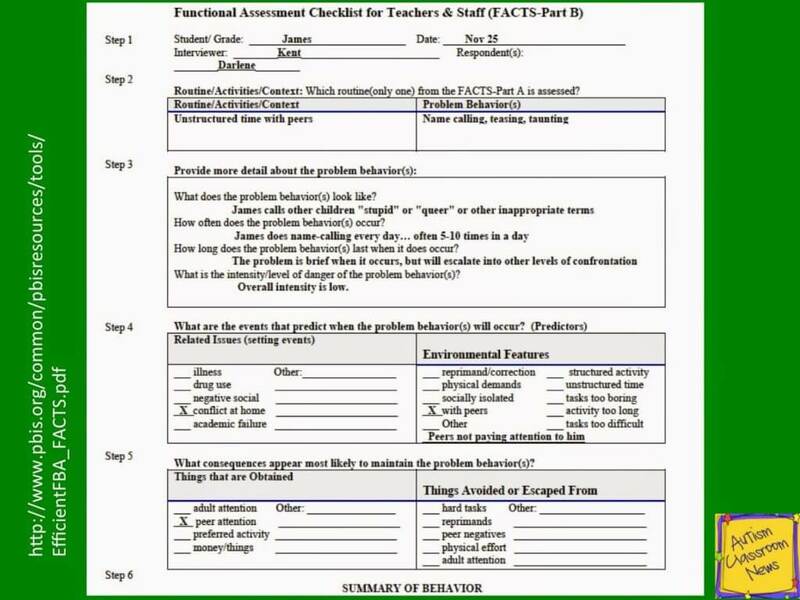 Finally the Functional Assessment Checklist for Teachers and Staff (FACTS) is one of the most extensively researched assessment interview tools. It is designed to be used by someone with knowledge of how to use it and as a process tool for teams to use to complete an FBA. When combined with a confirmatory observation, it has been found to be fairly reliable and valid in assessing the function of the challenging behavior. 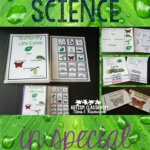 Whereas many of the tools noted above are designed for the population of individuals with developmental disabilities, the FACTS is designed for any population and specifically designed to be used in schools. It focuses on routines assessments, rather than definitions of target behaviors, when determining what to tackle first and then has the team focus on 3 routines within the day that are most problematic. While interviews are one form of indirect assessment, checklists are another. As noted in the previous post, one of the disadvantages of checklists is that you can’t see the person’s demeanor or hear their tone of voice when answering the questions. Nonetheless we continue to use them because they are quick and easy and often tell us where we need to follow up. 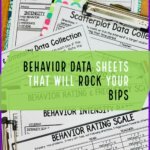 I will sometimes use them as a way to document staff’s or families’ perceptions of behavior when I am not able to directly observe it initially, so that we can move forward to program planning while still assessing the behavior. Some useful checklists to use with staff are below. 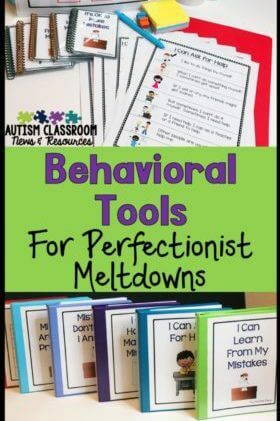 CECP’s Problem Behavior Checklist is one I use for individuals not on the autism spectrum or those who are but for whom I don’t suspect there is an automatic reinforcement component. One of the things I like about it is that it breaks out escape and attention by function of attention / escape from peers and attention or escape from adults. This can really useful when assessing socially motivated students with or without ASD. The Motivation Assessment Scale (MAS) was developed by Mark Durand and Dan Crimmins as one of the first, if not the first, checklist for assessing challenging behavior. As such there has been much research on it showing that, when compared to an experimental functional analysis (which some consider the gold standard but there is research to indicate it might not be the perfect assessment), it has iffy reliability and validity in assessing functions. As with any indirect assessment tool, there is a good bit of bias that can be introduced which can render most of these checklists less reliable than observational data of any kind. However, for providing background information and starting information for the FBA they can still be helpful. One of the elements that I like about the MAS is that it includes automatic reinforcement (sensory) as a potential function with some of the questions. It yields a score based on the responses that give you an idea of what might be the function of the behavior. The MAS is available for purchase HERE. You might be able to find older versions around the web but it is a commercially available item so I didn’t want to contribute to violating their copyright. Finally, there is the Questionnaire About Behavior Function (QABF). The QABF is designed for people with developmental disabilities (although there is a mental illness format that I’m less familiar with) and has some research to indicate it has pretty good reliability and validity. Like the rest it asks questions about the behaviors and then you score it to see which functions appear to be the most prevalent based on reports. Students who are old enough to understand the questions and whose disability doesn’t impact their ability to understand and provide information should be included in the FBA process. One way to do that is to complete interviews with them about their behavior and about their thoughts regarding school and their environment. Sometimes the process of interviewing the student is more telling than the information they report. I once had a student tell me that he wasn’t allowed to answer my questions because he had been told not to share personal information with strangers. He then went on to try to answer some questions the thought he would be comfortable with and then asked me to erase them. Then he realized if I kept the paper I would still be able to read the answers. He became very upset about this. It was no wonder that I found him sitting under the table in his classroom when I first met him. The experience was more telling than his responses would ever be–and were critical to me understanding his behavior. 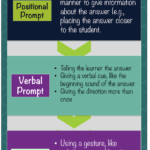 Below are some tools and checklists designed specifically for students. Function-Based Interview Tool for Students (Other language versions are available on the website) is designed for students third grade and older who are able to answer simple questions about their behavior, and is a great way to get the students involved. New Jersey PBS in Schools also has a Student Social Support Survey that the students (3rd grade or over) complete to talk about whether they have someone in their lives who helps with school work, praises them for doing something well, etc. It is available in other languages as well HERE. The Student Assisted Interview is based on an article by Kern et al. (1994) and is designed to elicit information from the student about his/her perceptions regarding school work, teacher / family support, what activities are difficult, when they have the most struggles, what they really like about school, etc. So, there are certainly many more checklists and interviews out there. These are just some that I’ve found the most useful. Please share any others you’ve found helpful in the comments. Our next step will be moving toward direct assessment and data collection, which is where I will pick up next time. 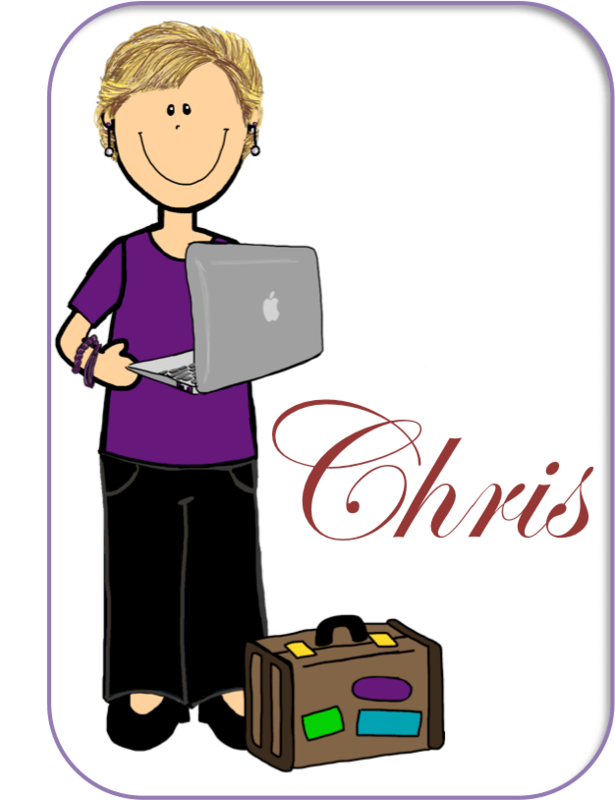 I've loved your series – way too many teachers don't get any of this background in school, or in on-going professional development. And it always had interested me in how different a.b.a. intervention is from the East coast to the West. Thanks for disseminating all of this information. Thanks Susan! It still surprises me the different perceptions of behavioral support everywhere based on people's experience with other professionals. Thanks for reading! The Fast is also an assessment used as part of an FBA. Thank you for the great links. Yes it is, but when I wrote the article it wasn’t available online. Thanks for sharing that!